Failed To Fetch Google Chrome Repository - Why this happen? This caused Google dropped Google Chrome support for GNU/Linux 32bit distribution. As announced in December, Google plans to discontinue 32-bit Google Chrome for Linux this March. However Chromium browser is goo choice to replace Google Chrome, because the 32bit build configurations for Chromium continues to be supported. "W:Failed to fetch http://dl.google.com/linux/chrome/deb/dists/stable/Release Unable to find expected entry 'main/binary-i386/Packages' in Release file (Wrong sources.list entry or malformed file)"
"Skipping acquire of configured file ‘main/binary-i386/Packages’ as repository ‘http://dl.google.com/linux/chrome/deb stable InRelease’ doesn’t support architecture ‘i386’"
The small Google Chrome for Linux team can not support all versions of Ubuntu and other Linux distributions. With Linux already a small overall percentile of Chrome’s user base, and 32-bit users amongst that percentage even smaller. "To provide the best experience for the most-used Linux versions, we will end support for Google Chrome on 32-bit Linux, Ubuntu Precise (12.04), and Debian 7 (wheezy) in early March, 2016. Chrome will continue to function on these platforms but will no longer receive updates and security fixes. We intend to continue supporting the 32-bit build configurations on Linux to support building Chromium. If you are using Precise, we’d recommend that you to upgrade to Trusty", says Dirk Pranke, Software Engineer, Google. You might to like How To Mirror Android Screen to Your Linux Dekstop Using Google Chrome Apps. The solution to fix this error is modify the sources.list file. You can edit the source.list in different ways : Using a command line or through a GUI. Ok, you may have your own preferred method but I'll give the easiest ways. Cheers! ‘W:Failed to fetch http://dl.google.com/....Wrong sources.list entry or malformed file)’ should no longer appear. Have another's errors? See Linuxslaves Linux error solution page. 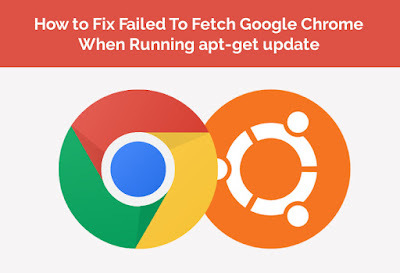 That's all I can write about Failed to Fetch’ Chrome apt-get update Error. Hope you've enjoyed reading this tutorial as much I’ve enjoyed writing it and thanks for visiting us.